'I love Seneca's letters because they're written in the spirit in which I was educated in my family -- not to look for fame and fortune, but to have a simple, honest, honorable life,' he said. For Filipaj, the degree comes after years of studying late into the night in his Bronx apartment, where he'd open his books after a 2:30-11 p.m. shift as a 'heavy cleaner' -- his job title. Before exam time or to finish a paper, he'd pull all-nighters, then go to class in the morning and then to work. 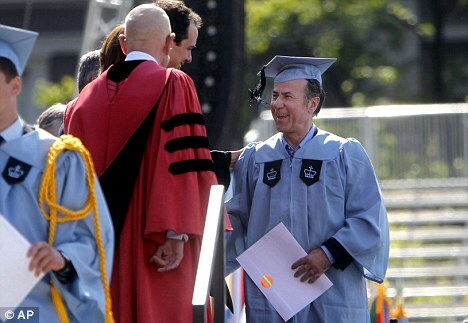 Later, Filipaj got a big hug from his boss, Donald Schlosser, Columbia's assistant vice president for campus operations. 'And if I have too much, I just go to sleep,' he says, laughing. 'They say, 'Aren't you...?'' he said with a grin. For now, he's trying to get 'a better job,' maybe as supervisor of custodians or something similar, at Columbia if possible. 'The richness is in me, in my heart and in my head, not in my pockets,' said Filipaj, who is now an American citizen. Associated Press. 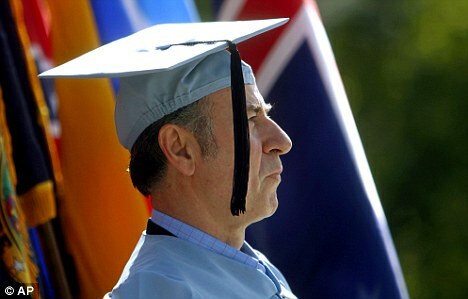 "Columbia University janitor swaps his jumpsuit for cap and gown to graduate with honors". DailyMail.co.uk . 14 May 2012. Web.